It’s Idaho folks. One of the most beautiful places in the country. We have great outdoors. Warm days and cool evenings. You don’t have to blow your budget on an indoor reception venue for your reception. You can save money by transforming your backyard or one of the many parks in the area into a stunningly beautiful place with the help of MME Music Magic Events. With your wedding outdoors you are no longer at the mercy of the venue for your date or the catering of food. An outdoor wedding allows you to be able to choose a site that has meaning to the two of you, such as that park where you shared your first kiss or that place that you saw and said to yourself, “I would love to be married right here.” Maybe your parents home or the home of a relative/friend, a ranch someplace down by the river in a park, yes even a campsite in the mountains. This will allow you to save on any venue fees. 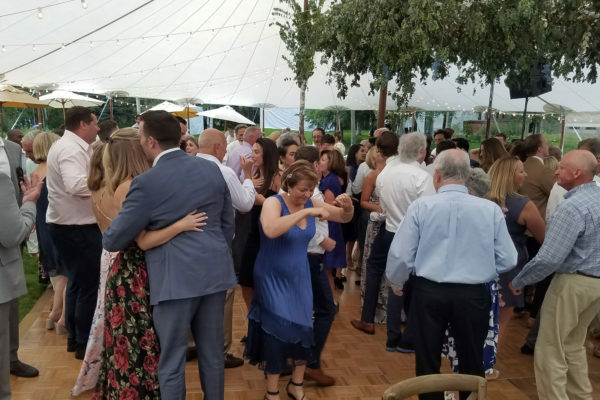 Also, you are able to decide the type of tables and chairs you want your guests to sit at, and are not limited by just what the indoor venue has onsite. Because many venues book weddings years in advance, if the date you wanted is booked, you are just out of luck or left to find another venue. When you have an outdoor wedding, you are in control of your wedding date. Another perk is your furry friends that walk on four legs they too can be a part of the day and share in the fun. If you want to have smoked BBQ or maybe food go with an authentic Mexican flare, you can have it. In a nutshell, your choices for food will be endless. If you choose to have a bar, you can do your own or hire one of the many local companies that do portable bars for weddings and events. Also, if your mom has that favorite family dish, you can serve that and let the caterer handle the rest. At MME Music Magic Events we are not only known for creating some of the most beautiful indoor spaces for Idaho weddings, we are also known for doing the same for outdoor spaces too. 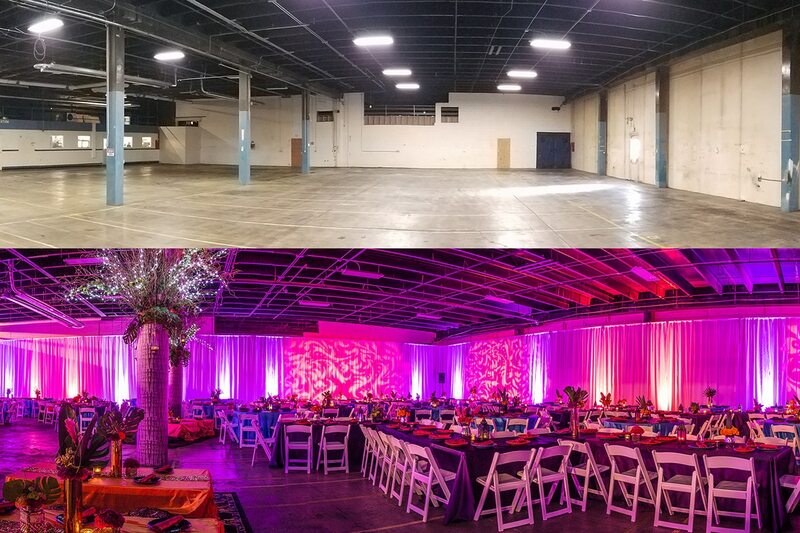 Whether you choose to have a tent or celebrate under the stars we can transform the place you choose with the use of LED uplighting, commercial warm LED market lights, and more. 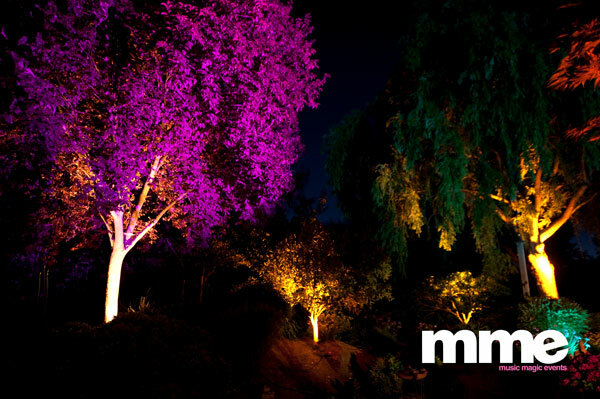 Our LED uplighting is wireless and battery powered so we can set them all around under the trees and bushes giving the area a unique glow with your colors. They look great under tents and can even be set to change colors with the music that is played by our DJs. All without stringing ugly cords or using AC power. Our warm LED Market Lighting (also called String Lighting or Cantina Lighting) is a perfect way to add elegance to a wedding. Unlike locally purchased string lighting, we use all LED bulbs, so we are eco-friendly. [500′ of our bulbs use only 200 watts compared to 3,500 watts of a standard bulbs.] You will never have to worry about blowing a breaker like so many have with traditional string lights.